I first started paying serious attention to politics at about the time Jimmy Carter became president. Our country seemed to drift from one crisis to another, and we suffered numerous humiliations and setbacks abroad. In the wake of Vietnam the Soviet Union seemed on a roll, with many nations falling to the communists during the 1970s. Demagogues across the globe realized that it was safe to insult the United States, and many lept at the chance. Symptomatic of Carter's term was his ambassador to the United Nations, Andrew Young. For example, during the trail of Soviet dissident Anatoly (now Natan) Shcharansky, Young claimed that there were "hundreds, maybe thousands, of people I would categorize as political prisoners" in the United States. While he later said that he was not equating the Soviet Union with the United States, he never explained what he meant either. Carter stuck by him, but Young was finally forced to resign after he met with a representative of the PLO, which was contrary to administration policy. Then came the election of Ronald Reagan and everything changed. No longer would we apologize for our role in the world. Integral to his view of the world was his appointment of Jeane Kirkpatrick as ambassador to the UN. She quickly put other nations on notice that insults to the US, to which they had gotten used to making, would no longer be tolerated. Far from apologizing for the United States, she demanded that other nations, in particular communist ones, apologize for theirs. There was a new sheriff in town, and and this one didn't let anyone intimidate her. She was never one for the idiologically fashionable. "They Always Blame America First"
All you have to do is change the relevant proper nouns and the same speech could be delivered today. Jeanne Kirkpatrick was perhaps the original neoconservative. While today it has become a term of opprobrium among liberals, back then it simply meant someone who had once been a Democrat but had become disillusioned with their party over it's adoption of a leftist foreign policy. Kirkpatrick had campaigned for Hubert Humphry, but had become very critical of President Carter and his policies. She became an advisor to Ronald Reagan, which led to her appointment as Ambassador to the UN. Her most famous essay during her time of transformation was "Dictatorships and Double Standards" in 1979, published as a book with some of her other works in 1982. It was among the first serious political works I read and I found myself agreeing with it's precepts. In the piece she criticized Carter's foreign policy, and discussed the fate of the Shah of Iran and Somoza of Nicaragua. Her essential thesis was that by abandoning repressive rightist regimes, we allowed far worse ones to come to power. From the frying pan into the fire, as it were. She also pointed out that thus far no "socialist" or communist regime had willingly democratized, and that "the architects of contemporary American foreign policy have little idea of how to go about encouraging the liberalization of an autocracy." Whatever one thinks of the details of her piece, it is hard to argue that Iran, for example is better off with its Khomeinist regime than it was under the Shah. It is very easy to moralize and say that you won't support a repressive government, but sometimes all the world offers is a choice between bad and worse. She supported the Argentine junta led by General Galtieri in it's "dirty war" against leftist opposition. This provoked some criticism, some of it justified. I don't know enough about the situation in Argentinia to know whether a leftist government would have gone full-scale communist, and we can't go back and replay history using different variables. In the end, though, what matters is that she was the right person at the right time. She, Reagan, and the others came to power at just the moment when it looked like the Soviet Union might win the Cold War after all. They stemmed, then reversed the tide, starting a series of events that eventually led to the collapse of the Evil Empire. Along with Reagan, she was famously hated by the left. Their enthusiasm for international institutions such as the UN who's function seems to be more and more supporting dictators and terrorists, is distressing, to say the least. Her modern-day successor, John Bolton, is hated in a similar fashion. Appropriately, he is moving into her old office at the American Enterprise Institute. It was another amazing evening outside of Walter Reed Army Medical Center in Washington DC. 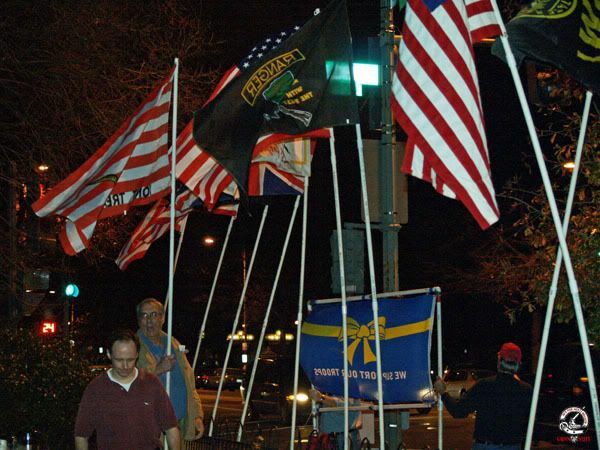 The faithful Freepers started gathering to show their support for our troops in the early evening, and before long we had all four corners covered. 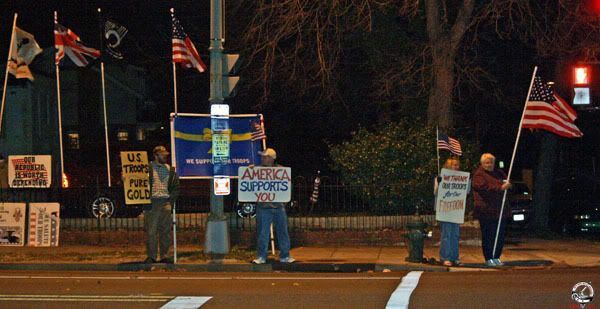 And once again, the good citizens of Washington DC showed their support by honking and waving from their cars as they drove by on Georgia Avenue. At first I thought that it was my imagination, as we seemed to be getting more support from the passers-by than usual, but as I spoke with other Freepers they got the same impression too. 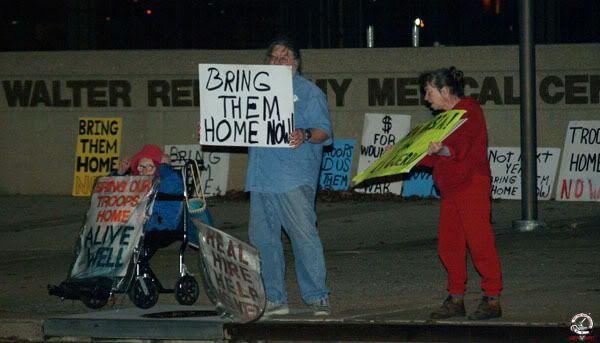 Occasionally we'll get a thumbs-down, or a "bring them home!" shouted at us, but by far most are messages of support. Given what we read in the news, it is encouraging to know that whatever their view of the politics of the matter, the vast majority of Americans support the troops. Readers of these AARs (After Action Reports) know that one of our objectives, and the original one, is to keep the communist-sympathizing Code Pink nutjobs away from the entrance of the hospital. 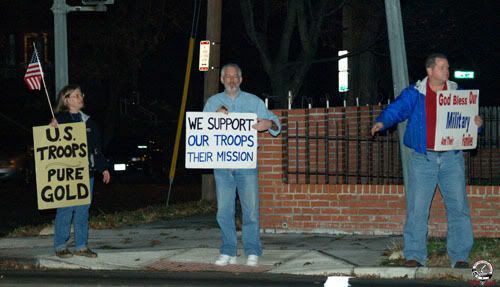 Another, of course, is general support of our troops and their mission. But a third, one that I've thought about recently, is to make sure that the horror of having our troops spit on and called '"baby killers" that we went through after Vietnam is never repeated. In this I believe we have been successful. 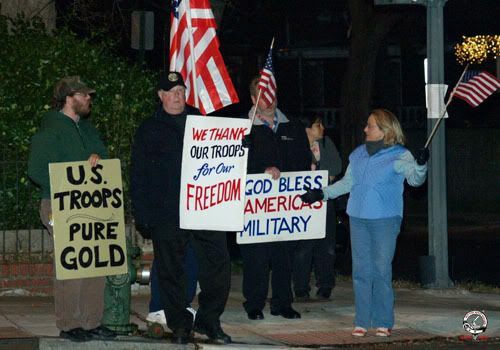 Through shame and exposure we have forced Code Pink to put away their "Maimed for a Lie" and "Enlist here to die for Halliburton" posters and replace them with messages such as "Love the Troops - Hate the War". Now, you and I, dear reader, know full well that the Pinkos couldn't care less about the welfare of our troops. Most are too infected with Bush Derangement Syndrome to think that deeply. 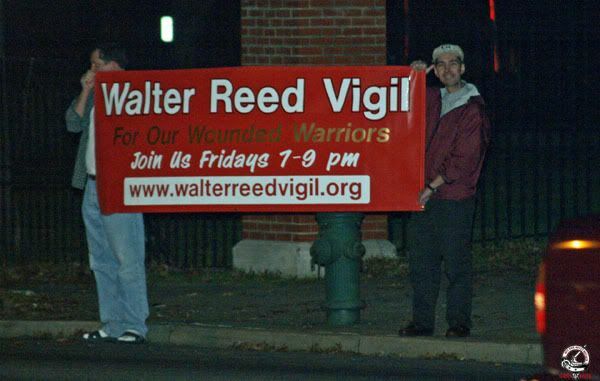 But it is a victory, is it not, when we can force them to rid themselves of the obnoxious messages of hate that they displayed in 2005 when they first started their anti-war protests outside of Walter Reed? "Vigil" my foot, it's an anti-war protest. I recall several Freeps last year when the Pinkos would bring out some of their older signs of the "No Blood for Oil" variety. We would hoot and holler at them from across the street, and sure enough, it would be gone the next week, if not that very same night. Last night the same pathetic 8 or 10 Pinkos showed up, halfway down the street where no one sees them, and no one cares. To be sure, part of our mission is to make sure that never again are they at the entrance of the hospital. Here are some of them, if you care. You'll notice that someone of them drags a poor wheelchair-bound lady out each night where they prop-up a sign in front of her. But enough of them. As I said in my last AAR, the Pinkos are, in a way, irrelevant. We're there for the troops. As the evening wore on, however, a new front moved in and the temperature dropped precipitously. By 9:00 it was in the low 40s, and when I checked the next morning my overnight thermometer showed freezing temperatures. While we started out dressed for summer, by the time the bus came all of us had our coats, hats, and gloves on. The upside is that with the wind our flags looked beautiful. That's me ("Tom the Redhunter") at lower left in this photo, and behind me is Jimmy Valentine's Brother. I believe TroopRally is at right facing the other direction. 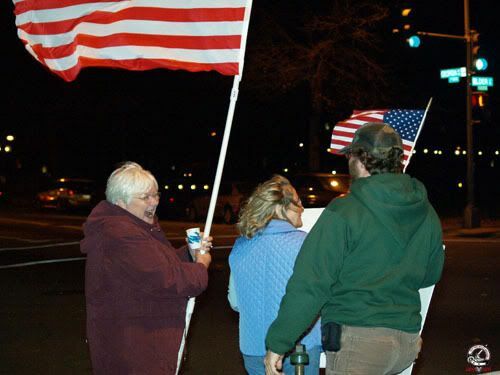 Here's another of Taco Mamma who is having a hard time holding on to her flag. Beside her are Fraxinus and Ethel (in blue). In addition to the usual honks and waves from the passers-by that evening, we received visits from other supporters. The first was "Specialist Dale", a hospital worker. She came out right as we were gathering to say how much she and the troops inside appreciated what we were doing. She pointed up to the hospital and said that soldiers had even requested window rooms so that they could see us. Not long later a lady who said that she worked for the DOD stopped by to tell us how much she appreciated what we were doing. She said that she was on her way in to pick up a wounded soldier (or Marine, I forget which) to take him to a special dinner at the White House. She said she would make sure and drive him buy us on her way out. Now if you're a regular reader of these AARs then you know that this sort of thing happens every single time. Over the past year and a half we've heard messages of support from hundreds of troopers and their families. And once again, anyone who thinks that all these rallies are meaningless exercises in feelgoodism is severely mistaken. Over the past year and a half I've heard from probably over a hundred troopers, their relatives, and WR employees, and I'll tell you that everyone in there knows that we're out there and the vast majority appreciate it. I'll relate one story to you from a few weeks ago that will illustrate the point. 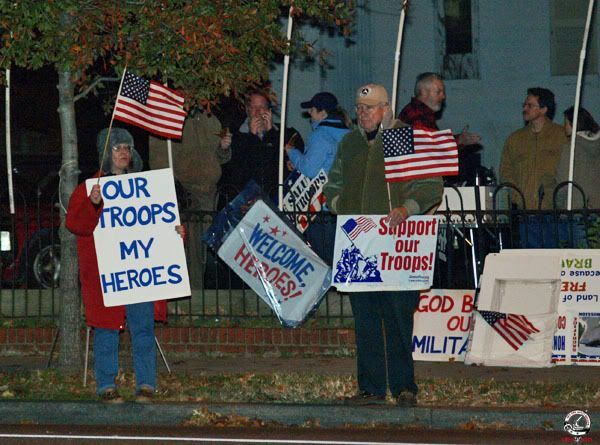 I was standing outside of the main entrance, holding a "Support the Troops" sign as usual. Out come two of our warriors, and although both had long pants on I could tell that each was missing part of a leg and had on a prosthetic. "Thank you for your support!" each said. "We're going downtown, can you point the way to the subway stop?" As the station is a few blocks off and it's a winding path through the streets to get there, there was no way I was going to let them walk. "Hop in my car and I'll take you" I said, and off we went. On the way they told me that one was Army and the other a Marine. One had been wounded in Fallujah and I forget where the other got hit. Once again they started in on how much they appreciated what we were doing (and prefaced everything with "sir"). "Guys, thanks" I replied. "But all we're doing is standing on street corners holding signs. It's you who are doing the real work. We do this because we appreciate you." This went on for another minute, and ended as all these conversations do - I got them to agree that we each supported the other. What an amazing bunch they are. Here were two guys, each with an injury they will carry with them for the rest of their lives, and here they are saying that they appreciate us. They're selfless and patriotic, and we are a fortunate nation indeed to have such men and women. "Lurker Bill" has become something of a one-man institution during these Freeps. Every Friday he arrives like clockwork and takes up his station on what we now call "Bill's Corner". His dedication is truely admireable. tgslTakoma, andBufordP are beside him at left. As you'll also notice, this photo was taken relatively early on, because by 8:30 or so tgslTakoma had on her red down coat and winter hat. If you live anywhere within driving distance of Washington DC, we'd love to see you for the evening. Many times over the past year Freepers and supporters have taken Friday off work to drive considerable distances to join us for the evening. There are many places to stay in the area, and of course if you want to make a weekend of it there's no better tourist spot than our nation's capital. Just a thought, but again we'd love to see you, and if you have questions send one or more of us a FreepMail. * A special thank you to PleaDeal for taking all of the photos used in this post. She blogs at Semper Gratus. 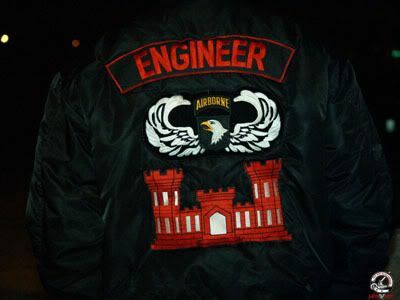 * This AAR has been cross-posted at Free Republic.